This simple spinach smoothie can be made in no time at all. It tastes just as delicious with or without the addition of mango. It's one of the cheapest, simplest and yummiest smoothies you’ll ever try. With the right ingredients, it isn't difficult to mask the taste of vegetables in most culinary creations. After all, not everybody particularly enjoys munching on leafy greens straight-up at the crack of dawn. Stay energized in the morning by slurping on something that is tasty and good for you in equal measure. The secret is to overwhelm the flavour of cruciferous vegetables with a tango of other tastes: chocolate and vanilla protein. Nobody would ever be able to guess that there's spinach in your smoothie bowl. Packed with maca, avocado, spirulina, and protein powder, this chocolate berry smoothie bowl is packed with nutritious surprises. This vegan chocolate berry smoothie bowl recipe is courtesy of PumpUp member @veganyogi. Find more smoothie recipes from the PumpUp community here, and by searching the #smoothie tag on PumpUp. Have an amazing smoothie recipe to share with the PumpUp community? Let us know in the comments below or tag them on Instagram with #TeamPumpUp. For some, green smoothies seem like green monsters. They're daunting and downright unappealing. The odds of you actually enjoying a green smoothie can be ever in your favour when you sweeten it up with a bit of fruit rather than refined sugar. Add the juice of your favourite citrus sphere, add chunks of something sweet and tropical, and you, friend, have a 3 ingredient green smoothie. No fuss or worry necessary. Simple preparation leads to extraordinarily nutritious results. Blend and enjoy. Add water if necessary to make the smoothie's consistency less viscous. Enjoyed this simple 3 ingredient green smoothie? What are your favourite smoothie combinations using 3 ingredients? Comment below or tag your best smoothie recipes on the PumpUp app! Recipe courtesy of PumpUp member @veganmetalhead. 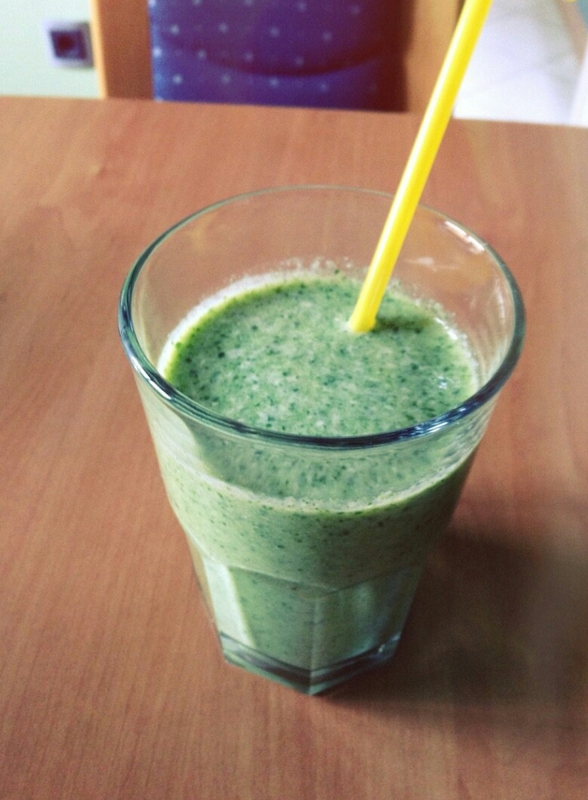 It’s pretty easy being green with PumpUp member @jessischill’s awesome smoothie recipe! 1 banana, 3 chopped dates, 2 cups spinach, 1.5 cups unsweetened vanilla almond milk. You won’t be a Grinch at all. Instead, you’ll be jingling all the way for the rest of your day! To win a PumpUp shaker bottle, open up the app, tag your winter smoothie recipes with #SmoothieSeries and comment on this pic! Now green granola doesn’t mean what you think it means. It simply denotes that this smoothie is made with greens. And granola. Capisce? Here’s PumpUp’s smoothiegurl’s first ever green smoothie for you! Blend away and bottoms up! Green is good, but greens in smoothies are great. This delicious and detoxifying beverage is incredible for you! Spinach is blended with tropical delights to make @randiashley’s green smoothie a taste of paradise. Blend away and enjoy the rest of your day!